Boscombe precinct has had a spooky makeover! 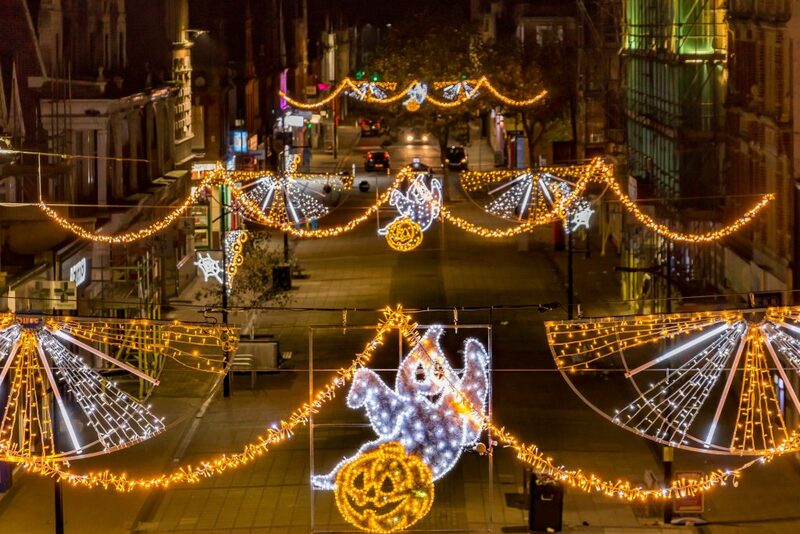 Adorned with a series of ghosts and pumpkins, today marks the first day of Winter Lights in the High Street. The scheme, created by town centre lighting specialists Gala Lights, on behalf of Bournemouth Coastal BID, was switched-on last night and will remain in place until spring 2018. It will see two seasonal changes, on 25th November for a Christmas makeover, featuring stars and baubles, and on 20th January with the addition of hearts for Valentine’s day. The increasing popularity of Halloween as a retail opportunity has helped increase demand for ‘Winter Lighting’ – bringing the traditional Christmas lights season forwards 2-3 weeks to incorporate Halloween too. Winter Lights are installed mid-October and remain in place throughout the dark winter months until spring, when the evenings start to get lighter. Boscombe’s Winter Lights were installed last night, by local Electrical Installation and Maintenance company Event Power Engineering, who will be responsible for the seasonal adaptations being made at Christmas and Valentine’s Day.